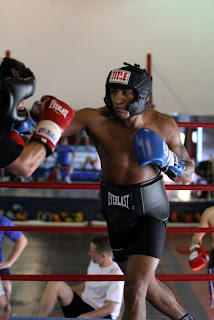 Joel Julio (35-3, 31 KO's), training in Deerfield Beach, Florida, spoke about his upcoming fight on April 24th with WBO Light Middleweight Champion, Alfredo Angulo (17-1, 14 KO’s). Julio also has more confidence because he has added new members to his team. Julio feels he is in the best shape of his entire career. Julio is not by any means underestimating Angulo's abilities. “We know that he’s a strong fighter. He comes forward, so we are working on a lot of different things," Julio stated. "We’re working on counter punching; we’re working on speed and movement. We will keep him out of his comfort zone. “We are not going to fool each other. We are both able to knock people out. We both have power in our punches. But if you look at my record, you’ll see that I have 31 knockouts and it’s not by coincidence! At anytime in the 12 rounds either one of us can go, I just don’t think it’s going to be me! All three of Julio's losses came against southpaws (James Kirkland TKO 6, Sergiy Dzinziruk UD 12 and Carlos Quintana UD 12), who were undefeated at the time Julio faced them. This time, Julio’s camp feels his superior experience and new training regimen will propel him to a win in Angulo’s home state. This fight is co-promoted by Main Events, All Star Boxing, Inc. and Goossen Tutor Promotions. The 10 round bout will be Joel Julio’s third appearance on HBO. The fight will be held at Citizens Business Bank Arena in Ontario, California. It will be televised on HBO’s Boxing After Dark as the co-feature to “Ring Of Fire", an NABO and IBF International Heavyweight Championship fight between Tomasz Adamek and Chris Arreola on April 24th, 11:15pm ET/PT.